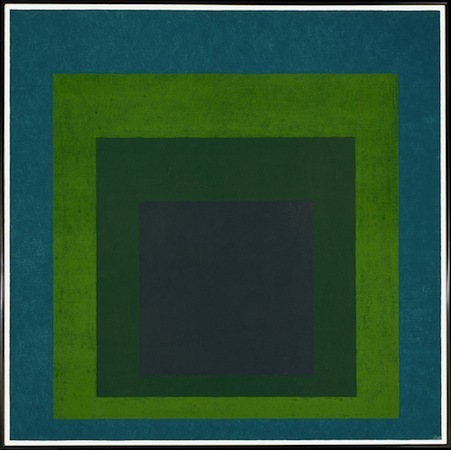 Take a moment to really look deeply at this example of Josef Albers’ extensive series, Homage to the Square. The composition of this painting is simple enough – four progressively smaller squares within each other, each in a different color, and all aligned closer to the bottom of the composition than to the top. So stand back from this Homage to the Square and look at the whole thing. What is the relationship between the squares? Are they stacked on top of each other, like cut out pieces of construction paper? Are they sinking underneath each other, as if you are looking at a painting of a tunnel? Do some appear to push toward you and others to fall away? And how does it change between each version of the painting? Looking at the pieces, you may find that you are able to force your eyes to see a stack of blocks or a tunnel, or you may find that you are instinctively drawn to one interpretation of how the squares are arranged. This is exactly the principle that Albers experimented with as he produced hundreds of variations on this theme over a period of about 25 years. These included paintings, drawings, prints, and tapestries—but each explored the same basic question: can an artist create the appearance of three dimensions, using only color relations? Though Albers began work on the Homage paintings in 1950, he was introduced to color theory very early in his career, when he enrolled as a student at the Bauhaus in 1920. 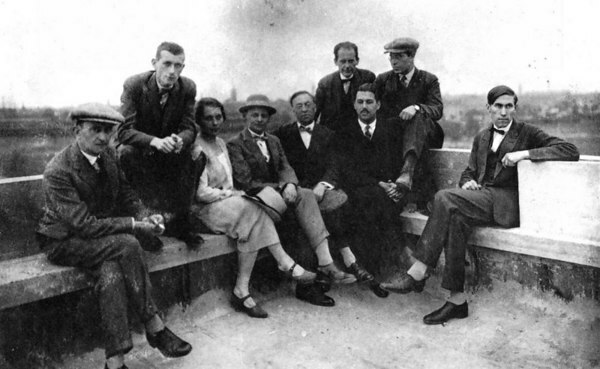 The Bauhaus was a revolutionary school of art and design in Germany, founded by Walter Gropius in 1919. Its philosophy was to integrate the principles of fine art and functional design, and many of the most important artists in Europe were teachers there. When Albers was a student, the foundation for all Bauhaus education was the Vorkurs, or preliminary course, taught by Johannes Itten. The course covered the fundamentals of material, composition, and color theory, and was one of the most influential and widely disseminated aspects of Bauhaus curriculum. 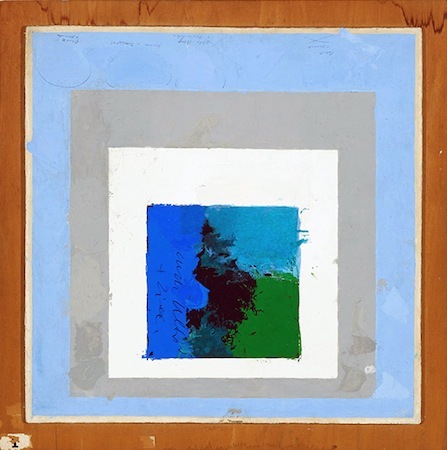 Many studies done by students as part of the Vorkurs can be seen in museums and exhibitions, and they often bear a resemblance to Albers’ Homage paintings: a repeated series of shapes, each in different color combinations. The goal of these exercises was for the students to understand how colors related to each other. 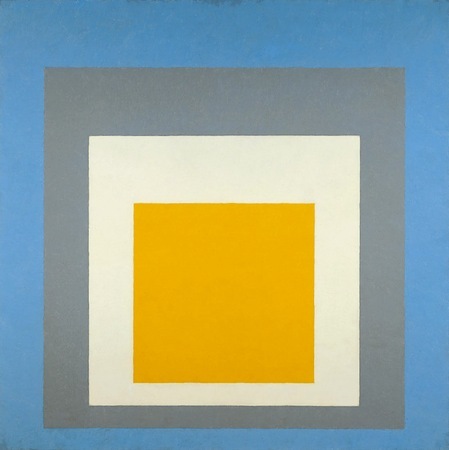 Many years later, Albers used the Homage paintings to go into even more depth with those lessons, and bring them to audiences, as well as art students. In 1925, the year that the Bauhaus moved from Weimar to their iconic building in Dessau, Gropius invited Albers to be the first student of the Bauhaus to join the faculty. Albers worked with Paul Klee in the stained glass workshop and was the longest-serving member of the faculty when the school was shut down by the Nazis in 1933. But the Bauhaus was to be only the first of Albers’ celebrated and influential teaching positions. When that school was shut down, Albers’ and his wife, Anni—herself an influential artist and Bauhaus alumna—emigrated to the United States, where he was invited to teach at the revolutionary Black Mountain College in North Carolina, and later Yale University, where he began the first Homage paintings in 1950. An encouraging but strict teacher, Albers brought Bauhaus ideas to a new country, introducing his disciplined approach to color theory to the next generation of the artistic vanguard in America. For all their variety of color, the Homage paintings are relatively cold and clinical. It is interesting to compare them to paintings by Mark Rothko, who produces canvasses that have strong similarities to the Homage series. 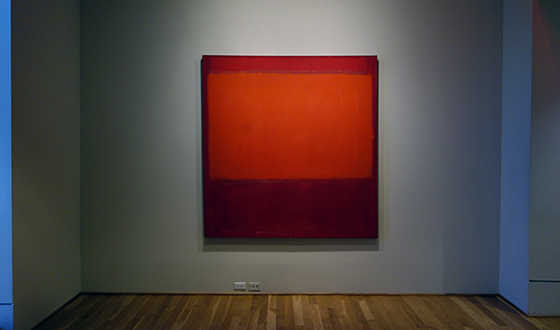 Albers and Rothko both use roughly square or rectangular forms in solid colors, and both take the relationship between colors as their subject matter. But while Rothko’s paintings use variation of color to suggest or inspire certain emotional reactions, Albers’ paintings are exploring the creation of space through the use of color. He experiments with subverting the limits of two-dimensional space. The idea of creating space through color goes back to a technique known as atmospheric perspective. The best examples can be seen in landscapes of the Dutch Golden Age and Italian Renaissance artists such as Leonardo da Vinci. The principle of atmospheric perspective is that objects that are far away are less saturated in color, and have less contrast. 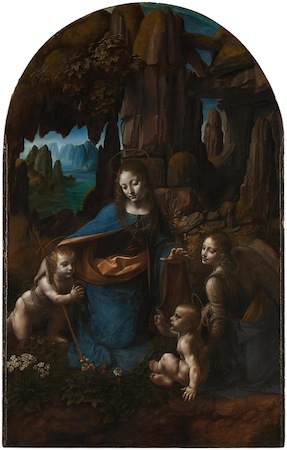 Looking at the mountains behind Leonardo’s Virgin of the Rocks, each set of mountains that is farther away is closer in color to the sky than the set of mountains in front of it. 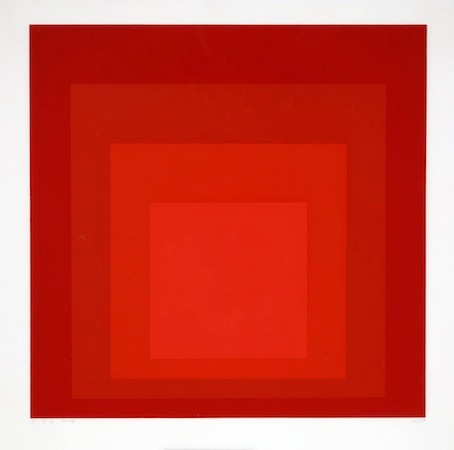 This technique had been used to create space in representative paintings going back to antiquity, but Albers was revolutionary in applying it to abstract art. His experiments in the Homage series paved the way for artists such as Bridget Riley and a whole generation of Op artists, who also pushed the limits of two-dimensional media by creating large-scale optical illusions. Though Homage to the Square may seem boring and repetitive to some, their simple beauty is often compared to classical music, like the work of Bach: a study on theme and variation. Cite this page as: Shawn Roggenkamp, "Josef Albers, Homage to the Square," in Smarthistory, August 9, 2015, accessed April 20, 2019, https://smarthistory.org/albers-homage-to-the-square/.